Now in production for over a decade, the Remington Model 597 is truly an all-American rifle, currently made by the company in its Mayfield, Kentucky, and Huntsville, Alabama, plants. I have had a Model 597 in the kitchen since 1999. Equipped with a laminated stock and chambered for the .22 WMR, it comes in handy for the occasional coyote or fox that thinks it can sneak unchallenged onto my property. The new version, being much lighter, is a good candidate to replace this one for small game duties. Currently, there are no wood-stocked versions of this gun, and it’s now chambered only to .22 Long Rifle. It features a futuristic-looking Kryptek Mandrake camo stock and a curt 16.5-inch barrel with a threaded muzzle. The gun has a light, airy feel to it—perfect for a day on the North Forty without breaking a sweat. The new Model 597 Kryptek checks in at 5.5 pounds. In comparing both rifles, nothing major has changed with the overall stock design, and the profile is essentially the same. The stock has a reverse cut to it at the fore-end, which is a hefty two inches wide back to the trigger guard. Noticeably absent is a pair of sling swivel studs. The marks are there for the holes but, alas, no swivel studs on this gun—or any of the Model 597s, for that matter. They’re a worthwhile feature in a field rifle. The new version of the 597—now available only in .22 LR—is offered with a threaded 16.5-inch barrel and comes with a thread protector. Shouldering the gun, I found it very comfortable to shoot. The pistol grip is just the right size, while the buttstock has a nice drop to it for lining up with the scope. There is no cheekpiece, and I don’t miss it. The stock is finished off with a plastic buttplate. I’m not in favor of plastic for field use because it slips too easily. Thoughts of replacing the buttplate vanished when I noticed there are no screws; it’s glued in. In any event, the overall finish of the stock is good, and the fitting is excellent especially around the action and the floorplate. The gun has been around for more than a decade, which proves it is reliable and trustworthy in the field. Remington designed the bolt-guidance system to include a twin set of steel guide rails or rods for better accuracy, feeding and strength as the bolt follows after each shot. 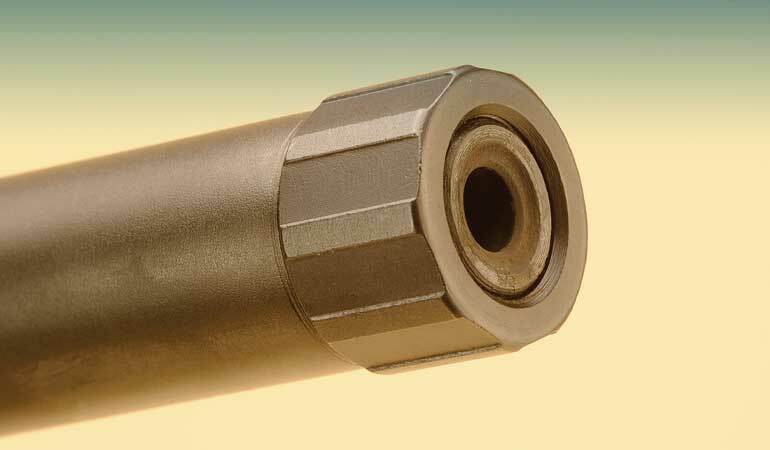 Additionally, within the alloy receiver, the hammer, sear and bolt have a Teflon/nickel-plated finish for a smooth operation during each cycle. 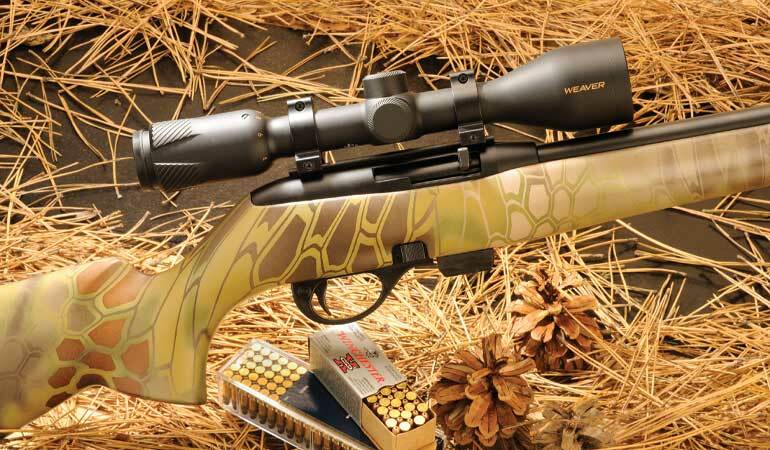 The trigger has no slack before the sear moves, but regrettably for those wanting as much accuracy as possible from this rifle, the trigger pull hit the high side of six pounds and is not adjustable. The trigger face is wider than most and offers a good purchase, but regardless, it could be made a little lighter. The magazine has a wide bumper, which makes it easy to seat even when fully loaded. The safety is located on the polymer trigger guard and is the typical crossbolt design. Pushing the button to the left allows the gun to fire and shows a bright red ring noting this position. The trigger guard itself is streamlined in appearance and includes the magazine well and bolt release on the right-hand side. The magazines have been upgraded to include a Teflon coating for smooth feeding and trouble-free operation. Capacity is 10 rounds, and the magazine has a wide bumper on the bottom that allows you to seat the magazine fully in the gun with little effort. The bolt locks back after the last shot. As mentioned, the steel barrel is 16.5 inches long with a satin black finish. It’s threaded and ships with a thread protector. 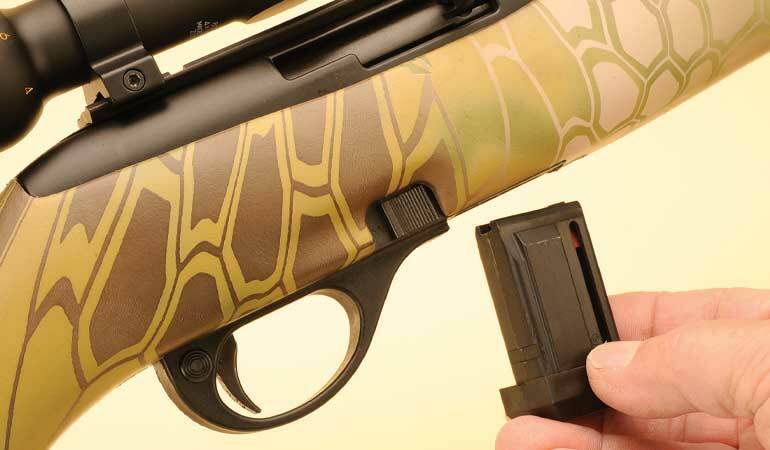 Remington engineers have found a way to attach the barrel to the receiver rigidly and in perfect alignment for the best in accuracy. 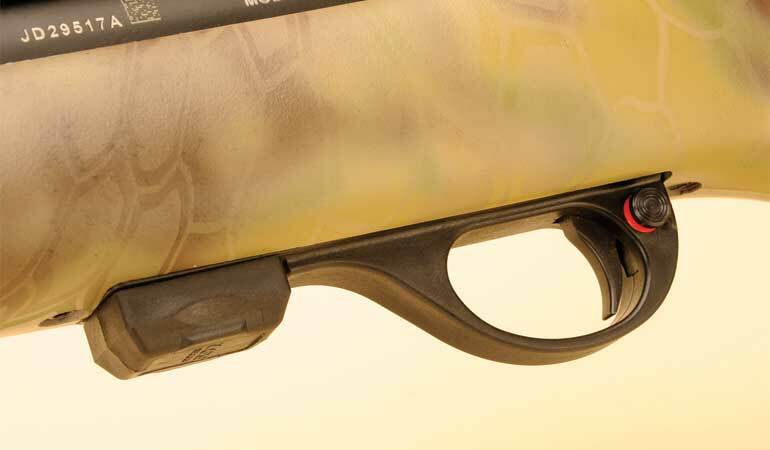 There are no sights on the barrel, but it comes with a Weaver-type rail mount attached. The polymer trigger guard incorporates both the mag well and the bolt release, which is on the right side. Trzoniec found the trigger too heavy for his tastes. I installed a Weaver 4-16x44mm scope in Leupold rings for a classic, low-mounted look. While some may snicker at my choice, the scope does have a close-focus distance of 25 yards, making it perfect for rimfire use on pesky vermin. Shooting a .22 semiauto at the range is always a lot of fun. Load her up, sit down and plink away. Just like driving your father’s Hydra-Matic Oldsmobile. The stock fit right, the reach to the magazine was fine for reloading, and the gun was accurate. In fact, using our protocol of five shots at 50 yards, one of the best groups was from CCI’s standard velocity 40-grain that measured just 0.38 inch. For the $289 price tag, the gun is a bargain in fit, function and accuracy, but I really think Remington should round it off to an even $300 and include sling swivel studs and work on that trigger.